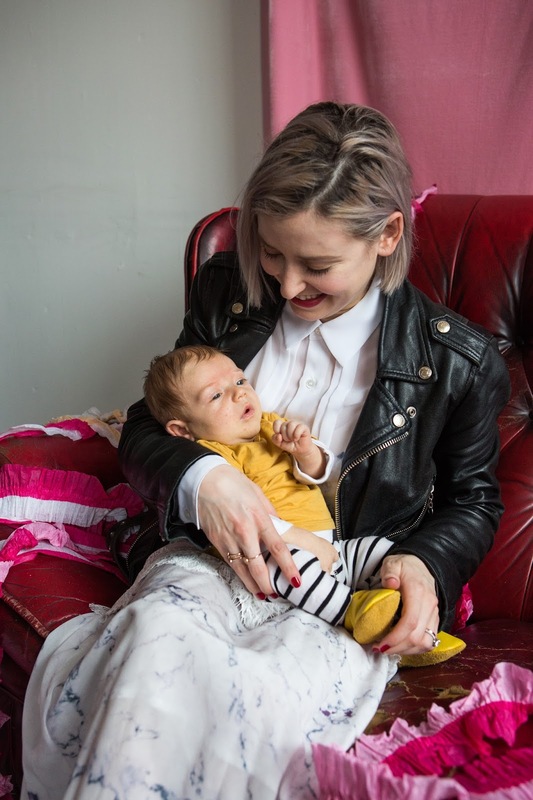 You may remember a couple of weeks ago, the wonderful Love My Dress featured our take on motherhood and the industry, which we’ve named the Jugglist Massive. You may also remember seeing our beaming faces on the follow-up posts we did, and our babies’ beaming faces too. Those focused on the AMCWF team, but we’re nothing without our exhibitors, and we’ve decided to share some of their Jugglist Massive moments too, to publicly salute them in their endeavours, and to give them a virtual pat on the back to keep them going (which will, of course, becoming a physical pat on the back on March 18th and 19th). 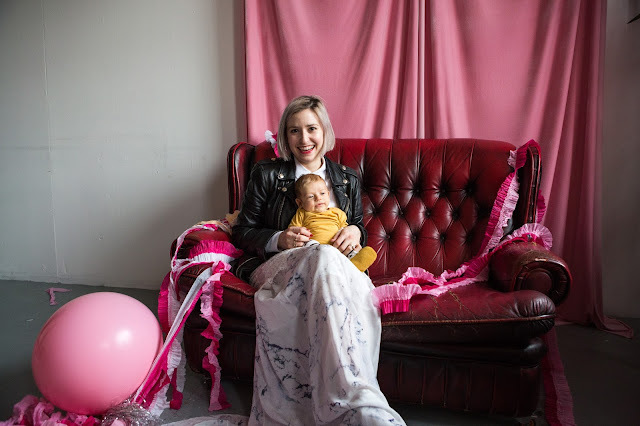 We’re super pleased to introduce our interview with Dana Dallal, of DANA DALLAL BRIDAL: mamma of baby Axel, 2 months and a bit, Jugglist extraordinaire, and designer of sumptuous bridal dresses a la the one in our promotional images! When did you have your baby? We had little Axel in December 2016 and it's been a busy couple of months. What do you feel the challenges are of running your own wedding business alongside motherhood? I don’t think I realised just how little down time I would have in these first few months! I think I expected the baby to sleep more and that during his naps I could do some work, little did I know. Axel only naps for two hours straight when I have him in the pram walking around but luckily he isn’t a bad night sleeper and I get quite a few good nights of sleep during the week. Because of the limited free time, I’ve had to scale back some of my plans. Instead of making a full new collection, I have decided to add a few complimentary dress styles to the existing line up, which makes everything a lot more manageable. My first priority is to get my existing client’s dresses finished which takes time as well so I have had to make some choices regarding my ambitions and be realistic about what I can achieve.There really is so little time when you have a new baby so you need to take a step back first and asses when and what is possible to get done and you have to base this around your baby’s rhythm. I’m breast-feeding him as well so that takes a huge chunk of time out of my day. Making the choice to scale back and seeing this as a positive decision has been really difficult. You have to remind yourself that having achievable goals is much better and more fulfilling than making big plans and then failing to hit those targets. How about the positives (which you might not feel but can accept haha!) It’s really hard to find much time in these early days but I have a great mother in law who is happy to babysit while I work. There really isn’t anything as rewarding as seeing Axel’s first smile or his first giggle and being home for those things is a real plus. I think the time flexibility is also a real plus as long as you can keep focused, you can work fun activities into your day and then get some work done in the evening when my husband comes home. Describe a day in the life of you and your business. We get up at about 8.00am and Axel eats for about 45 minutes, then the next hour is when he is content to be on his own so I rush around to get myself showered and dressed before feeding him again and then making a break for the nearest café to check my emails and place any orders I need in. Axel eats every 3ish hours and it takes about an hour to feed and change him so you can imagine it takes at least 8 hours of my day up! If I need to sketch or pattern cut I pop him in a sling so he can take his nap in there while I work. He really wants to be close to us at this young age so napping on us is sometimes the only way to get some free time to do work. Usually I can only get about 3ish hours of work done a day so I have to be disciplined and that hasn’t really happened until a couple of weeks ago. When do you work best? Mornings and early afternoon are when Axel is most content so as you can tell, it all revolves around him and his schedule at the moment! He sleeps for 45 minutes up to an hour and a half so that’s when I can work at the moment. How do you work best? With Axel in a sling. It’s the only way he will settle at home for an extended period of time. The thing is I also have to entertain him, as he gets older he needs more stimulation to develop his brain and keep him from getting bored so that takes another few hours out of my day as well. It's not easy finding the time! What time does it all kick off for you? Evenings are the hardest for us, trying to eat dinner and get chores done is pretty challenging and the evenings are pretty baby focused. From around 6.30pm it’s all about Axel until 8am the next morning, when it's also all about Axel…seeing a trend here! What time do you usually throw in the towel? I am tempted to throw in the towel at all times! But managing those expectations is what keeps me sane; although I won’t pretend I’m very good at it! What have you learnt the hard way since having a child and running a business simultaneously? You never realise how hard it is until you are in the thick of it and the baby has arrived and you are getting very little sleep! I thought it would be easier which makes me laugh now but we are still working out how much we can get done and when. Obviously the baby is the first priority and he is so young so that means growing the business has taken a back seat which is probably for the best at the moment as it means I can just about keep up with it all. Let us know your most stressed out/most jugglist/most frustrating/most challenging moment so far? I recently got Axel sleeping 4 hour stretches at night, then feed him and that is followed by another 3 hour stretch so one night I planned that the next day I could get some work done during his naps. Of course that night Axel hardly slept at all and I was completely exhausted and broken! The hardest and most frustrating thing is that I can’t plan like I used to. If we are having a bad day where he is crying a lot or needs extra attention then I cant get anything done so I cant rely on doing things last minute! Do you think there is enough support for mothers running their own business? This is a hard one - probably not, but my mother in law and husband help me out a lot so I don't really need to seek out extra support at the moment. I think when Axel is a bit older and can go to Nursery I will have a bit more time on my hands, and with free childcare extending to 30 hours from a younger age I hope I'll be able to pick up the pace. But those free spots are hard to come by and the Nurseries they are offered in may not be the ones that you would choose to go for if you had other options. Do you find the industry supportive? We are so new at being a family that I haven't run into many situations where I felt disappointed with the behaviour or opinions of others. Mostly I’ve been finding that the general public are very helpful, people love babies and are excited about it when I let them know its our first one. I have had to delay some deadlines and so far, I have only received good vibes. Shout out to Dana Dallal, baby Axel and co - keep doing what you're doing. What beauties, eh? We're going to posting some more Jugglist interviews soon so keep your eyes peeled!